The fact that Hu Jintao refuses to talk to the Danish press as he visits Denmark next week. Apparently he never has in China either, in the almost ten years that he has been General Secretary, President, etc. etc. Right now, as I search Google news, all articles fail to mention that the Danes are very skeptical towards a state leader that won't meet the press, and who leads a country whose politics oppresses its own people (no freedom of speech, no democracy, massive violations of human rights), but it is all over the Danish news (in Danish, sorry). He runs a dictatorship, basically. Thanks to Mao. 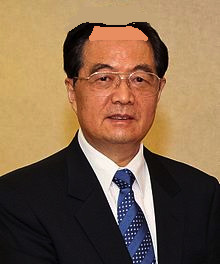 Hu Jintao, with slight editing.